We were first contacted by the client, a global cultural association, in February for the organisation of a day of activities on Lake Maggiore. The purpose was to finish off a week-long trip around Europe for a thousand university students, letting them experience the culture and natural beauty of the territory. After weeks of brainstorming different ideas, it all boiled down to a day of sports with a cultural excursion. The timeframe was tight, from 12 p.m. to 5 p.m., so the organisation and logistics had to be smooth and efficient. The participants were divided into two groups of five hundred people each. 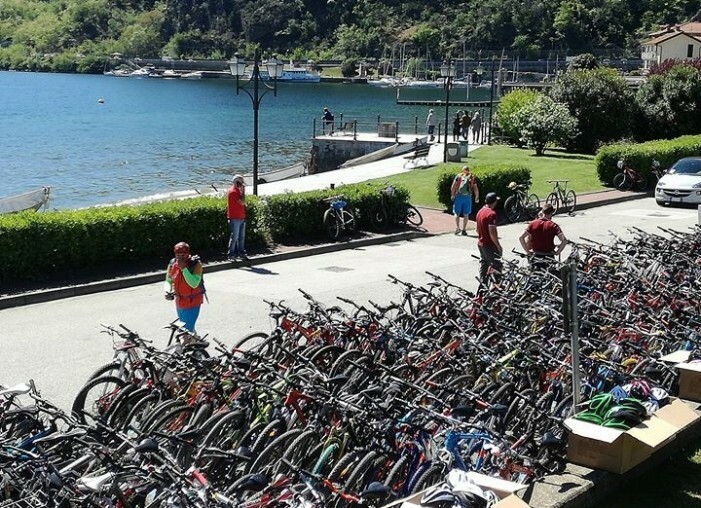 The first group arrived by bus in Feriolo where they departed, 250 by bike and 250 on foot, for an excursion in the beautiful Toce Natural Reserve. After an hour they switched, so the bikers went walking and the hikers biking. The second group arrived in Stresa and were transferred by boat to Isola Bella, where they were taken on a guided tour of the spectacular baroque palace and botanical garden. The real challenge was the afternoon switch, when 500 people arrived in Feriolo via water from Isola Bella and 500 had to depart by boat from Feriolo to Isola Bella, with only two jetties available. Our guides did an amazing job (with their megaphones) gathering their groups and synchronising the transfers. In the end, it went beyond our expectations. We had amazing, heart-felt feedback from the client, who claimed this to be the best day of the entire trip. With the help of some 50 collaborators and streamlined coordination , the day turned out to be a great success!